PET RAT AGILITY, CLOTHING, COSTUMES, OUTFITS, DRESSES, COATS, SWEATERS AND MORE FOR YOUR PET RAT! Fancy Rat Agility or Pet Rat Agility is just like dog or cat agility competition only the contestants are Fancy Rats and the agility equipment is smaller and set up for Fancy Rats. 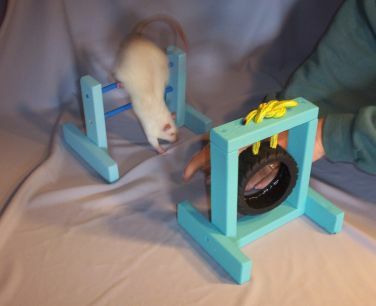 Fancy Rat Agility is gaining popularity as it is fun to participate in as well as to watch the Fancy Rats maneuver the agility equipment. Fancy Rat agility equipment is FAR easier to store and transport then either cat or dog agility equipment. As a matter of a fact... so are the Fancy Rats easier to house and transport than a cat or a dog... and quieter too. You may well be surprised how easy it is to train a rattie to do agility. You and the rattie will have a lot of fun together too. 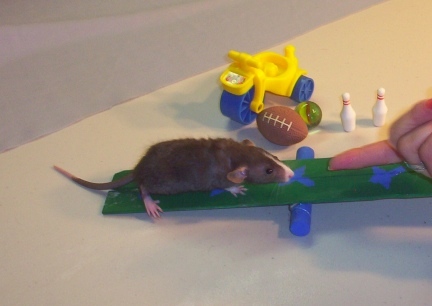 Rat Agility is a sport you and your pet rat can enjoy alone, show off to your friends and family as well as teach other rat owners to enjoy with you. You can get a group together and have a great time. You will meet many people, come my become friends for life, or even a spouse. So grab your fancy rat and get started. 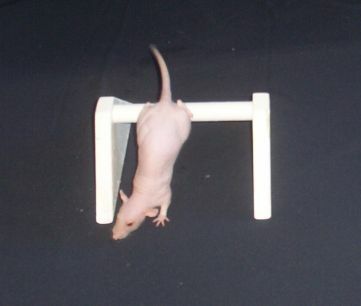 Most of the answers to your questions about Fancy Rat Agility are right here in this website. Take a look around our website for ideas and training tips. We have a trick training page with ideas of tricks to train your rattie. Your fancy pet rat will so enjoy the time together training....and the treats you bring to training sections. The more time you spend training the more time you will want to spend training and the more time you will spend with your rattie friend. This is all a win-win situation. WE ARE THE ORIGINAL MAKERS OF OF RAT CLOTHES, CLOTHING, OUTFITS (outfit), SWEATERS (sweater), (sweater) HATS (hat) AND COSTUMES. WE FIRST MAKE THEM FOR OUR OWN RATTIES AND OTHERS COULD NOT WAIT TO DRESS THEIR RATTIES UP TOO. ALL OF OUR PATTERNS ARE MADE BY US AND TESTED BY OUR OWN RATTIES FIRST. PLEASE NOTE THAT RATTIE CAN AND DO MOVE ABOUT FREELY WHILE WEARING OUR DESIGNS. The photos on this site of ratties doing Agility as well as other tricks and dressed are photos of our own ratties, trained by us. All rats on this site, unless otherwise noted are our own pets. The top photo is an approx 6 month old Hairless Dumbo named The Ballerina who has (in this photo) just started training. The third photo on this page is of our rat named Sugar. 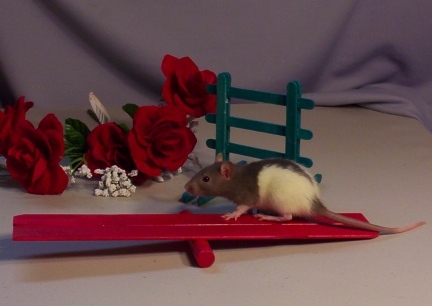 Sugar was featured in RATS MAGAZINE running an Agility Course. The photo at the right is of Tia when she was very young at a Rat/Rabbit Agility evening in Antigo, WI. We host a monthly Rattie Photo Contest with daily voting by the general public picking the winners, We have added a page about Animals in Heaven, a Members Photo Album area on the Rat Photos page, a Rats as Pets page, Rattie Recipes, Rat Crafts a place were everyone can find an easy to make rattie craft to make, as well as new products we offer for sale on our Rat Items For Sale page. We now have Rat Sweaters listed for sale, take a look. Also note that we have added links within our menu to our other websites. We now have a page for Rat Celebration, with information on World Rat Day and Year Of The Rat. If you enjoy Rat Agility, take a look at our Rabbit Agility website. You may enjoy it too, surely you will enjoy the photos. If you have a photo for our Rattie Photo Contest, a monthly event with multi prizes or a Recipe for Ratties you would like to share (please send a photo of your rat or ratties with your recipe to post next to your recipes). Sign in and submit your photo for the contest. For the recipes or crafts that you share with us, please send those via email with the subject line clearly marked. This is just a short video of baby Yetta Nada learning a few Rat Agility Equipment pieces for the first time. We of course think she is adorable and just wanted to show her off a bit on the Front Page. We hope you will enjoy our Fancy Rat Agility Website and visit often. Thanks for visiting, please join The Agile Rat Yahoo Group eList to chat with us about Small Animal Agility, Rat Ownership, Rat Care and Training and more rattie topics. Just click the Yellow Box below for more information on joining this fun eList. Here are a few pictures of Little Mac when he was just a baby. Little Mac learned a lot before he became an adult. Little Mac has a page on this website with photos and videos of him doing tricks, tasks and agility. I hope you will take a look. He might be a bit spoiled, but he like it that way. This site is under construction by a computer illiterate person... so bear with us Please over look all spelling and grammar errors. THIS SITE, THE AGILE RAT, IS A WORK IN PROGRESS. New and just getting started. The new Disney Movie Ratatouille shows how fun Rats can be. While Fancy Pet Rats make wonderful pets, do your research. Ratties are trainable and fun pets, but do need proper care and housing. Fancy Pet Rats do not, like Remmy (Remmie), cook or guide folks around by the hair under their hats. Unlike Emile, Fancy Pet Rats do need a good grade feed made just for them found in a pet store or even Wal-Mart. Yes, Ratties do enjoy some of what you are eating...just a small amount and not too much of it. Ratatouille is a great and fun movie. Watch it again and again, but remember it is Disney. Fancy Pet Rats have, like a dog or any other animal, their own personalities, needs and wants.